This VizGlow example describes a self-consistent plasma simulation of an inductively coupled plasma (ICP) with a bias voltage. Typically, a quasi-neutral formulation is preferable over self-consistent for high density plasma discharges where Debye lengths become very small relative to geometric dimensions in the discharge. Sheath thickness become negligible compared to the physical system and can be ignored. This is common in ICP and microwave plasmas and under these conditions a quasi-neutral approximation may be made. This approximation is similar to the approximation in high Reynolds number flows in fluid mechanics where the Euler equations are used and the thin boundary layers are neglected. The quasi-neutral formulation is easier to solve numerically compared to self-consistent, numerically less stiff, and allows for larger time-steps. In this example however, resolving the sheath becomes important with the presence of an RF bias. 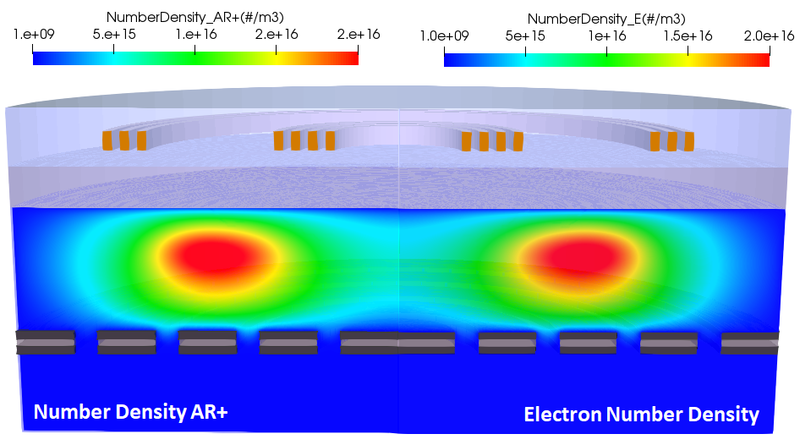 Bias effects are used to enhance and control the ion energy distributions at substrate surfaces within the sheath. Capturing the sheath in these applications is necessary, therefore the self-consistent formulation is used. The geometry and mesh for the plasma discharge simulation are shown in the following figure. The axisymmetric discharge comprises of a coilcage with seven coils, dielectric window, gas (plasma region), and electrodes separated by a dielectric. The coils are driven by radio-frequency (RF) currents to generate non-equilibrium plasma within the tube with an RF frequency of 13.56MHz and 1000W cycle-averaged power. The reactor is simulated at 50mTorr with pure Argon gas. The electrode bias voltage is -100V. The coupled model is solved including electrostatic potential, species density, electron energy, bulk energy, electromagnetics in the frequency domain, and the external circuit model. First, volume traces are used to track changes in number densities to ensure a converged solution. The following plot shows number density of the charged species (Ar=red, electrons=blue) vs. time. The left plot tracks number density on one of the electrode surfaces. The right monitor tracks number density in the volume directly between two electrodes. Notice that the traces have all flattened out. This demonstrates steady state convergence of the simulation. Results for the converged solution are shown below, including EM wave (real and imaginary), AR+ number density, and electron number density. 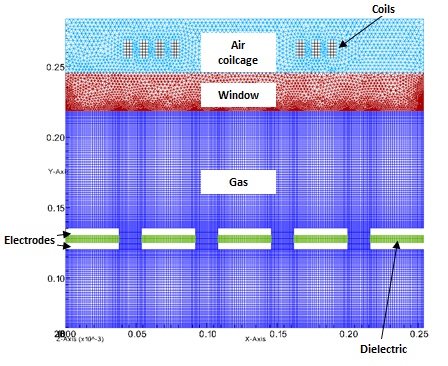 The EM waves deposit power into the gas through the dielectric window on the coilcage side. The EM power deposition causes a localized plasma skin depth effect; however, the presence of bias enhances skin depth and power deposition. The plasma generation is centered between the sets of coils and extends through the region between the window and the electrodes. Peak plasma number density is approximately 2.0E+16 #/m3. This example uses the self-consistent formulation to resolve the sheaths for the ICP with a bias voltage. 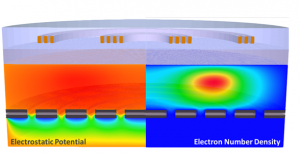 VizGlow provides a wide range of physical models and options that allows one to simulate complex coupled phenomena that are encountered in most plasma discharges. It is part of the OverViz Simulation Suite which provides a variety of modules for plasma-fluid-electromagnetic-particle simulations with an intuitive interface. VizGlow is provably fast, robust, easy-to-use, and currently a leading industrial plasma simulation tool.